As most Internet professionals have heard by now, Google started rolling out Panda 4.0 on May 20. Although Panda is refreshed monthly, this is a major update meaning an algorithmic change has been made. For those of you confused about the difference between Penguin and Panda, here is a brief overview of both, followed by a look at how to identify whether or not your site was actually hit by Panda. Google Penguin was first announced in April 2012 and it is an algorithm developed to detect and lower the rankings of sites that have manipulative back link profiles. Having a back link profile with a high percentage of exact match anchor texts, having a lot of low-quality links, and having links from article directories and rich anchor text press releases were just a few of the things in the Penguins’ sights. This update shook up the industry because prior to, rich anchor text links where the primary practice for targeting and ranking keywords. Google Panda was rolled out in Feb. 2011. The days following the roll out were shocking to many sites as more than 12 percent of all search results were reported to have been affected by this algorithm. Unlike Penguin, the Panda algorithm was designed to detect websites that have thin or low-quality content and reduce their rankings in the SERPs. While this sounded like good news for quality websites and Googlers alike, the initial version of Panda failed to remove scraper sites from the SERPs and even ranked them above the original sites and to some extent, this is still true today. In 2012, Google announced that they would also be adding an over-optimization penalty to Panda. This was supposed to help sites with great content rank higher than sites with average content and better SEO, which gave birth to the content marketing craze. Unfortunately like the initial roll out, this update made some improvements but failed to deliver as intended. Fast forward to May 20, 2014 and Panda 4.0 was released. According to Search Engine Watch, Google stated that about 7.5 percent of English queries may see an impact from this update. While it is unclear the exact changes made, some industry leaders are speculating that this is the “Softer Panda” update aimed at helping small businesses rank higher that Matt Cutts mentioned back in March of 2014. I have seen data from my own clients that would leave me to believe this is at least part of the update. Here is an example. Sweetwater LLC is a small business that sells water purification systems. The content on the website is written by the business owner who is a geologist and spent several years working with river water and water contamination issues, so it is extremely unique, in depth and useful. Above you can see the rankings of his site just before and just after Panda 4.0 rolled out. 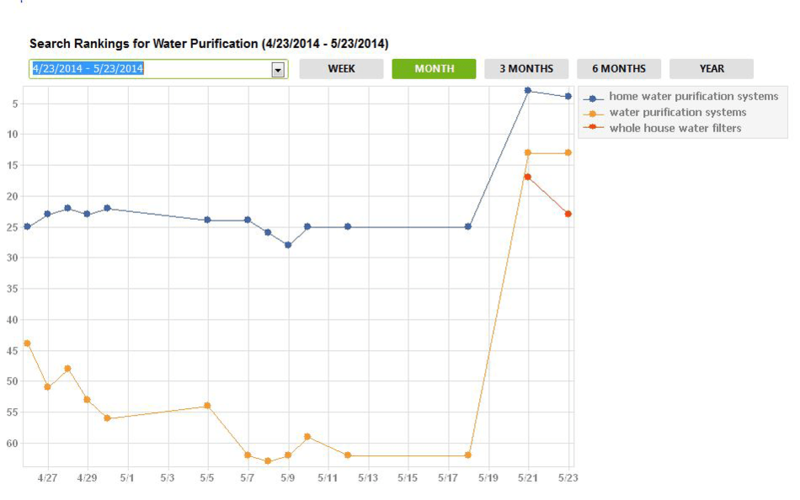 Whole house water filters went from not in the top 100 to around #20, water purification systems moved up 35 places to #12, and home water purification systems jumped from 25th to #3. I have seen this very same scenario repeat itself across a variety of niches ranging from e-commerce sites to local construction companies, all of which who took time to develop unique on-page content that added value to users. While it is still early to see where the dust where settle, it appears that this update may have in fact rewarded sites for their quality content. TROUBLESHOOTING YOUR SITE – WAS IT REALLY PANDA? After major Google algorithm updates, business owners and webmasters go into a near frenzied state if their site moved down in the rankings. In some cases, they are right to believe that they were the latest victim of Google, but many times it was something else that just happened to occur around the same time. If you have recently seen a decrease in your rankings, you should start by looking for thin content pages on your site. In case you missed it a few weeks ago, check out “Thin and Duplicate Content – A Great Way to Never Rank” and you will find a tutorial on how to use free software to identify these pages on your site. Eliminating content pages with fewer than 300 words of content is a good rule of thumb to get you started. You can also refer to a post on Google’s Webmaster Forum that lists what they consider to be good content. Even though pages with longer text tend to rank better in Google, more is not always better. Each page of content on your site should offer unique information about your product, service, or in the form of blog posts. If you find that you have several pages on a similar topic that are thin on content, you should consider combining them into a single page. If you are going to cover a topic already covered, make sure you do it better. As mentioned above, Panda also has an over optimization filter built into it. This means that you could have great content and still get hit. Many people with over optimized sites realized and fixed these issues when the algorithm rolled out. Although early, we could speculate that as the tolerance for spam links decreased over time with Penguin, perhaps the tolerance for on page over optimization could also be decreasing. Here are some of the issues known to trigger the over optimization penalty. Most of the things that cause a website to be over optimized are pretty obvious to even those with basic SEO knowledge, but if you have no clue, checking with a consultant to identify these issues is not a bad idea. Once you identify the issues, fixing them is pretty straightforward. MAYBE IT WASN’T PANDA AFTER ALL! If you checked the above issues and came up blank on what is causing the problem, it is possible that something else happened to lower your rankings. This means it is time to check is with your back link profile. Ask yourself the following questions. •Did I lose valuable back links around the time of the lost rankings? •Do I have deceptive or spam links pointing to my website? •Do I have links from a blog network that was penalized? •Are any of my back links rented or bought to game the SERPs? Chances are you will have found one or several issues with your site after reviewing the on-page SEO and back links. Make a checklist of the issues and fix them in order to be poised for recovery during the next monthly Panda update. You should also keep track of what action you took and whether or not it had any impact on your website. If you are still using tactics like keyword stuffing and ranking at the moment, you time is likely coming to an end so you should fix it now before the next evolution of Panda takes your site out.